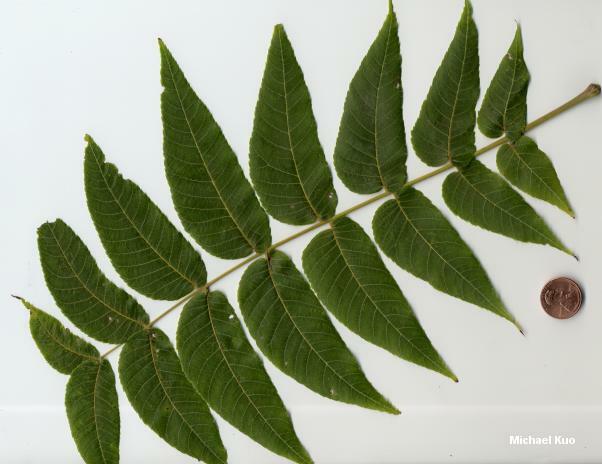 Long, compound leaves with many leaflets; large, round, bright green fruit with a distinctive odor; interior of twigs chambered; growing east of the Great Plains. 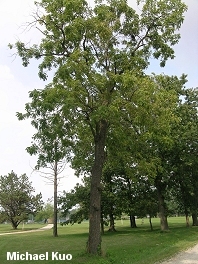 Habitat: Often on moist soil, but found in many forest types; frequently in relatively pure stands, especially where damage from logging or fire has occurred (Black Walnut secretes a chemical that inhibits the growth of other trees in its vicinity). Stature: 60-90 feet high; to 3 feet in diameter; with a straight trunk and an open crown. Leaves: 1-2 feet long; compound, composed of 15-23 flame-shaped leaflets that are 3-4 inches long, with finely serrated edges; yellowish green above; paler and finely hairy below. Bark: Thick; dark brown or black; furrowed, often with crossed ridges. 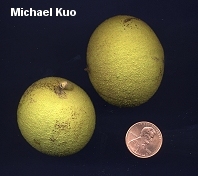 Morel hunters who are concerned with separating black walnut from white ash, which has somewhat similar bark, should compare the stature and twigs of the two trees. Twigs: With a chambered interior (see illustration). Fruit: Round; to 2 inches across; with a thick, yellowish green, finely hairy husk that leaves a distinctive, sharp odor on your fingers. Mycena luteopallens; Phellinus weirianus; and others.